Four leading credit card experts will debate and discuss: Professor Oren Barr-Gill from New York University School of Law and author of "Making Credit Safer"; Tom Brown a lawyer who has represented Visa; Professor Ron Mann from Columbia University and author of "Charge It"; and Victoria Strayer, Regulatory and Compliance Chief, TSYS, will share her thoughts on what she's hearing from their clients. The discussion will be moderated by David S. Evans, co-author of Paying with Plastic, and a noted expert on the card industry. Participate in a webcast featuring a live discussion between Arnold Kling, independent scholar and member of the Financial Working Group of the Mercatus Center and Daniel Kauffman, Senior Fellow at Brookings Institution and Former Director of World Bank Institute on - The Good, the Bad and the Ugly of Obama’s Proposed Financial Regulation Plan moderated by David S. Evans. We’ll debate the hard questions: What’s going to survive and what’s going to get killed on Capitol Hill? Would we be in this mess if the plan was implemented in 2001? Good idea or bad idea – giving the Fed more responsibility? You also will have an opportunity to ask our experts your toughest questions. Round table discussion from across the pond with Xavier Vives and Richard Portes, economics professors and research fellows at the London-based Centre for Economic Policy Research (CEPR). The discussion will be followed by a live, online Q&A moderated by Abel Mateus, former deputy chief of the Bank of Portugal, and former head of the Portugese Competition Authority. A live roundtable discussion with Robert E. Litan, a senior fellow at the Brookings Institution and vice president for research and policy at the Kauffman Foundation, Peter J. Wallison, the Arthur F. Burns Fellow in Financial Policy Studies and co-director of AEI's program on financial policy studies and Lawrence J. White, Professor of Economics at the Leonard N. Stern School at New York University. David Evans, Executive Director of the Jevons Institute for Competition Law and Economics at the University College London and a lecturer at the University of Chicago Law School will moderate. Several federal regulatory agencies now have oversight over various aspects of the financial industry. In the wake of the financial crisis, the Obama Administration, Congress, and a number of commentators have given serious consideration to consolidating regulatory oversight into a single uber agency. That’s the UK model where the Financial Services Authority is a one-stop-shop for all financial regulation. Will that work here? We consider the pros and cons in a live online discussion with ABA executive director Wayne Abernathy. Discussion of issues related to the current financial crisis and government's proposals for regulatory reform. Moderated by economist David Evans, FinReg21.com editor-in-chief. What caused the current financial crisis? In the view of Hoover Institution Senior Fellow and Stanford economist John B. Taylor, the blame falls squarely at the feet of government. Professor Taylor’s contrarian perspective crisis holds that the primary cause of the financial crisis was a botched monetary policy by the Federal Reserve under Alan Greenspan along with government efforts, such as promoting home ownership among the poor. Professor Taylor will expand on these in a live, virtual webcast on Wednesday, May 20 at 2 p.m. ET. 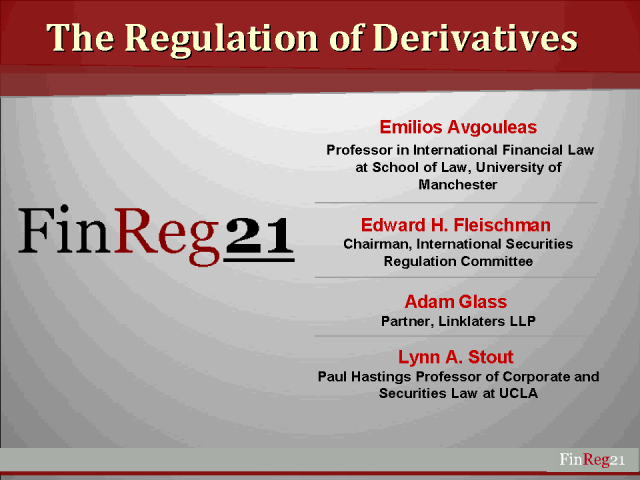 David S. Evans, an economist who is the editor-in-chief of FinReg21’s Lombard Street, will moderate. Is the world’s current financial crisis a failure of government or the market? Richard A. Posner, acclaimed jurist and author of an important and controversial new book, A Failure of Capitalism, debates the compelling question of whether capitalism has indeed failed our financial system and if regulation is the answer in a live webcast on May 14 at 2 p.m. ET. Judge Posner, one of the leading intellectuals of our day, will be joined in this provocative roundtable discussion by two noted experts in financial services: economist Robert E. Litan, who has written extensively on the financial crisis, and Brian P. Brooks, a nationally recognized attorney who specializes in subprime mortgage issues. David S. Evans, an economist who is the editor-in-chief of FinReg21’s Lombard Street will moderate.